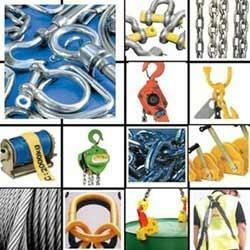 We are offering a wide range of Industrial Lifting Tools. We also offer custom made lifting tools chain slings, wire rope slings that are manufactured against drawings and tested by Govt. approved Labs. We also undertake manual and mechanical splicing, crimping of wire ropes. Furthermore, we also import shackles, clamps, hooks. Our assortment is widely appreciated for its dimensional accuracy, durability and corrosion resistance. Established in 1991, we, Tejas Enterprise, are among the renowned Supplier, Distributor, Trader, Importer and Exporter of a comprehensive range of Industrial Hand Tools. Our offered range is inclusive of Hand Tools, Non Sparking Tools, Pneumatic Tools and Measuring Tools & Gauges. Our products are highly regarded in the industry owing to their long functional life, outstanding resistance properties, and seamless finish. Widely utilized in interior decoration, our offered products are patronized by a large number of customers. These products are procured by us from highly reputed vendors, who are known for offering unsurpassable quality to the customers. We ensure that the products we offer are in compliance with the industry standards. We have acquired the legal status of Proprietorship Firm, and offer qualitative Industrial Hand Tools. For that purpose, we make sincere efforts to understand the exact requirements of the customers and deliver accordingly. Further, we offer fair payment and delivery terms to ease the process of conducting business with us. These are widely acknowledged for their dimensionally preciseness,sturdy construction and high tolerance. We exports our products in South Africa, Nigeria & Gulf Countries and import from Germany, UK, China & USA.